Svend E Kristensen | Team | BLAM! 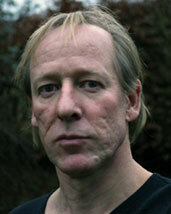 Svend E Kristensen: Actor, Sound Designer, Puppet Developement. A former musician (drummer) with great experimental need, turned the knobs of some of the first samplers and musiccomputers in DK. Since 1987 he started intensive dance training and between 1992-2000 he worked with and are educated by the awarded danish performance troupe Von Heiduck (Best performance Germany 1998-1999 ”Salome”). Von Heiduck toured Europe with their aclaimed series of Peepshows 1-4. After studies at Mediascience in Aarhus University and puppetry studies in Japan he established his own theatre of Neo-puppetry and performance ”The media and The Mask”. As a solo artist working with life-sized hypernaturalistic puppets he has played several times in Tokyo Japan, Thailand, Malaysia and Europe. Since 1999 he has worked as an actor with many a danish director and several companys. Since 1999 he teamed up with K. Ingimarsson for the first time and has on and off been involved in various functions such as e.g. acting and textworks in different performances. Kristensen is a sometime dj with a huge background and love for especially sampling, library music and soundtracks. So while never leaving the deep interest and work with sound, at first he made the sounddesign for Ingimarssons ”Fools of the world unite” performance and then tuned in for the extraordinary sounddesign following BLAM.